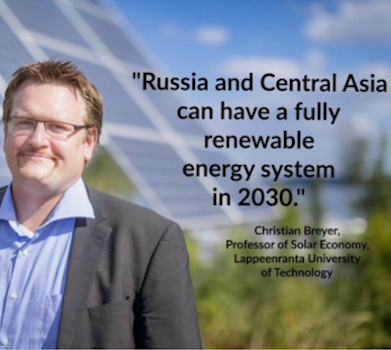 Renewable energy could supply Russia and Central Asian countries with all the electricity they need by 2030 — and cut costs significantly at the same time. Paul Brown from the Climate News Network and Komila Nabiyeva report. One of the key insights of the research is that energy sectors’ integration lowers the cost of electricity by 20 per cent for Russia and Central Asia. When moving to a renewable energy system, for example, natural gas is replaced with power-to-gas, converting electricity into gases such as hydrogen and synthetic natural gas. This increases the overall need for renewable energy. The region’s share in electricity generation (excluding large hydropower) remains very low. It varies from less than 1 per cent in Kazakhstan and Turkmenistan to about 3 per cent in Uzbekistan and Tajikistan. ADDITIONAL REPORTING: Komila Nabiyeva, a Berlin-based freelance journalist from Uzbekistan who reports on climate change, energy and development, contributed to this report.